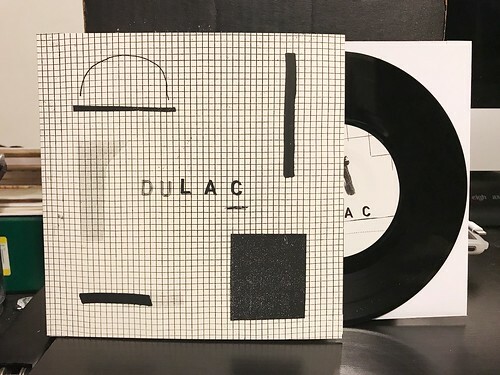 I Buy Way Too Many Records Dot Com: Dulac - Four Summers 7"
This is the third Dulac release I've reviewed on this site. I think I now have everything the band has released, but I thought that before only to find a rogue 7" I didn't know about. Previously, I'd compared Dulac very favorably to bands like The Estranged and Red Dons. I'm not sure exactly what has happened on this release, but those comparisons are out the window. Gone are the dark, chunky downstrokes, replaced by a cheerful jangly guitar chime. At first, I was taken aback by this change in direction. However, I think Dulac really took the title of this 7" to heart and have cranked out three summer appropriate hits. Make no bones about it, these are great songs. They're full of the sort of catchy and breezy pop hooks that make you really want a glass of lemonade. "Summertimin'" starts things off with a catchy melody and bright upbeat chord progressions. Again, very different from prior Dulac songs, but every bit as good. When we move on to "Drawing Blanks" the band adds in the soothing tones of Hammond style organ to mix in with their sunny tune. Lastly we have "Street Scene" It's probably my least favorite of the bunch as I'm not as into the vocal melody, but it still has a lot to offer with its big drum fills in the bridge and harmonica laden solo. At the end of the day, I probably like it more when Dulac is playing music that's a bit faster and fuzzy. Though if the next Dulac full length was full of songs like this, I'd buy that too. They just have a knack for writing great songs.